Welcome to our Registration Page. Initial Training for potential new volunteers is combined with Refresher Training for accredited volunteers. Please see the details and registration form below. The price differs for new volunteers and established volunteers because of the accreditation process required for the former. Please note that 3 or 4 hours of pre-reading is required in the week leading up to your training day. Friday May 31st, 9.30 am to 4 pm at St Mark’s, Bellerive, Cnr Scott and Clarence Streets. Places are limited and filling fast. Registrations close Monday May 20th but this training day might be full prior to then. If you would like to attend a course, please complete the form below to register. Prior to accepting your registration, the TCC EM will seek endorsement from your church/faith community/denomination and confirm that you are in good standing with your faith community. A Working With Vulnerable People card and a National Police Check are required, but these can be acquired after the EM training day. A police check can be obtained after your training day via TCCEM for a cost of $5. *Please bring copies of your Police Check and Working With Vulnerable People card to the training. If you don’t have a Police Check dated within the last two years, and/or a Working With Vulnerable People card (Note: both are required), the process to acquire these will be explained at your training. These are not required prior to the training but are required for subsequent accreditation. A police check can be obtained after your training day via the TCCEM for $5. Transfer funds online (preferred) Please use ‘EM’ then your first initial and your surname as the description (e.g., ‘EM G Yearsley’). Bank:	Commonwealth Bank. Name:	Tasmanian Council of Churches - Emergencies Ministry. BSB:	067103. Number: 1064 1483. Cheque (payable to ‘Tasmanian Council of Churches - Emergencies Ministry’) on the day or posted prior to the training day to Emergencies Ministry, PO Box 175, Rokeby, TAS 7019. Please advise if you require a tax invoice. I hereby consent to having my photograph taken at the training event for the purpose of generating an Identification Card. Nb. 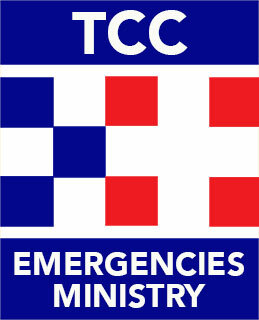 Images may be recorded at the training for the purpose of promotion of TCC Emergencies Ministry. (Please indicate to training staff on the day if you would not like your face to appear in general photographs).